Slow Cooker Little Smokies in Honey Garlic BBQ Sauce are one of the easiest, tastiest party foods ever and perfect for your next Game Day event! 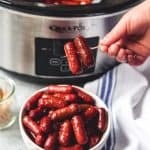 Place the lil' smokies in a crockpot. Dump all remaining ingredients over the lil' smokies, stirring to coat. Cover and cook on HIGH for 2-3 hours or on LOW for 4 hours, until hot and saucy, giving another stir and decreasing the temperature to WARM or LOW for serving. Serve right out of the crockpot with toothpicks for an easy appetizer or over rice with a salad or veggies on the side for an easy, super kid-friendly dinner.